Your 2019 Shenshawpotoo Lodge dues of $10 are due on or before October 31, 2018 (so you are paid in full BY November 1). You may pay online by going to www.sac-bsa.org/2019dues or pay through your troop. If paying through your troop, please see your Scoutmaster. 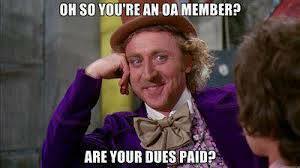 According to the Lodge's by-laws, if your dues are not paid by November 1st, you are not a member in good standing and would then have to pay a year of back dues and the current year for a total of $20 to be in good standing. Please remember, that you must maintain your Boy Scouts of America membership registration to continue being a member of the Order of the Arrow.